Nobel Peace Prize on Friday, October 9.
transformative figures who’ve been honored by this prize –men and women who’ve inspired me and inspired the entire world through their courageous pursuit of peace. environmentally sustainable practices. According to Voice of America, the comments came hours after the unexpected announcement in Oslo. 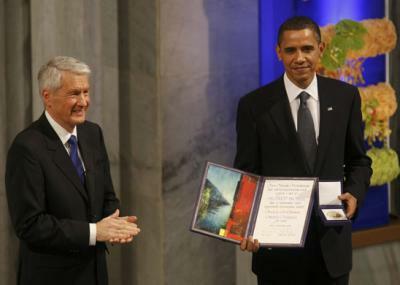 Nobel Committee chairman, Thorbjoern Jagland said the committee attached special importance to the President’s "vision of and work for a world without nuclear weapons." diplomacy and cooperation between peoples." President Obama, however, said he views the award not “as a recognition of my own accomplishments, but rather as an affirmation of American leadership on behalf of aspirations held by all people." Inaugurated in January of this year, President Obama joins an elite club of Noble Peace Prize winners including Dr Martin Luther King (1964), former US President Jimmy Carter (2002), International Atomic Energy Agency, Mohamed ElBaradei (2005).